At a performance in May 2018, participants from the community along with Ohio State students created original pieces to tell stories about their lives using storytelling, spoken-word poetry and music. Photo courtesy of Victor M. Espinosa. In an era marked by global migration, war refugees and terrorism, it is more important than ever to understand both how the uprooted, displaced and relocated find ways to create community and how communities incorporate new residents. Be the Street, a Global Arts and Humanities Discovery Theme project, brings residents of one of Columbus’ most diverse neighborhoods together with faculty and students from theatre, dance, folklore studies and Spanish and Portuguese. By collaborating with immigrant communities in the Hilltop area, the Be the Street team creates performances that tell stories of connectedness and belonging. “Performance is a powerful way for people to explore and reflect on events that impact their lives and the meaning it creates,” said Harmony Bench, associate professor of dance and 2016-18 co-investigator of the Be the Street team. Partnering with local nonprofits and organizations, Be the Street hosts movement and theater workshops and offers after-school activities designed to engage with community members and highlight their life stories. Be the Street has held workshops for participants ranging in age from middle schoolers to senior citizens from a variety of ethnic and racial backgrounds. Be the Street will open its doors to a public sharing of work on April 13, 2019, at the STEAM Factory. This year, together, with Ohio State student facilitators and Director Moriah Flagler, Hilltop residents explored their own life experiences with migration, identity and memory. Through theatre, movement and oral storytelling activities, participants’ stories have grown into performance pieces that will be shown to the public. Along with local partners like the Hilltop YMCA, West High School, Our Lady of Guadalupe Center and CleanTurn Enterprises, as well as a group of teens that gathers at the Hilltop Public Library, Be the Street works with the internationally recognized, Chicago-based Albany Park Theater Project. In January 2018, staff from the Albany Park Theater Project came to the Hilltop to lead a series of training workshops with the Be the Street team, teaching them how to create performances that drew from participants’ individual experiences as recounted through interviews. Using a style of performance known as “devised theatre,” Be the Street devisers from the Ohio State community, alongside Hilltop locals, collaborate to create their performance works throughout the year, incorporating themes from the performers’ own life stories. 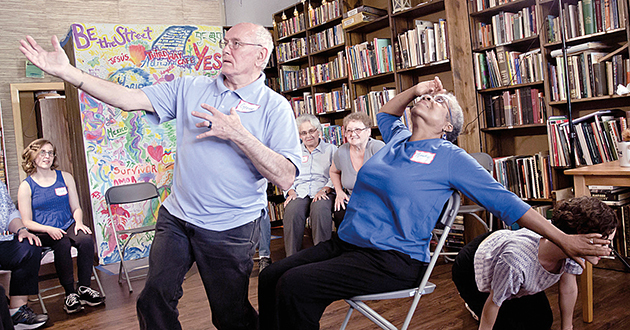 Senior citizens from the YMCA performed a dance movement piece to a voice-over in which the participants recalled favorite memories of their neighborhood. Teens from West High School used a theater game called “Cross the Line” to relate their recent experiences with threats of gun violence and lockdowns at their school. The teens who meet at the Hilltop Library wove together a series of vignettes about friendship and family across time and space; one portion included improvised piano and saxophone. Our Lady of Guadalupe Center participants, who were mostly immigrants from a variety of Latin American countries, performed a sort of choreo-poem centered on three questions: What have we left behind? How did we survive? What did we learn? Performing in both English and Spanish, the group reflected on the powerful feelings of loss and nostalgia that arise when moving to a new place. The three women from CleanTurn called themselves “The Warriors” and performed a recipe for transforming a survivor into a warrior. “Our hope is that this project accurately reflects the community in the Hilltop and demonstrates how local communities have something important to contribute,” Bench said. According to Ana Elena Puga, associate professor in the Departments of Theatre and Spanish and Portuguese, Be the Street is also an outreach program with the potential to have lasting impact. “I hope we can raise the funds to keep this program going, because based on what Hilltop participants tell me, it has stretched them creatively and meant something to them,” said Puga.